Former President George H.W. Bush and former first lady Barbara Bush, right, attend the official unveiling of portraits of former President George W. Bush and first lady Laura Bush at the White House in Washington, D.C., Thursday, May 31, 2012. AUGUSTA, Maine — In a statement released via Twitter, former Republican President George H.W. 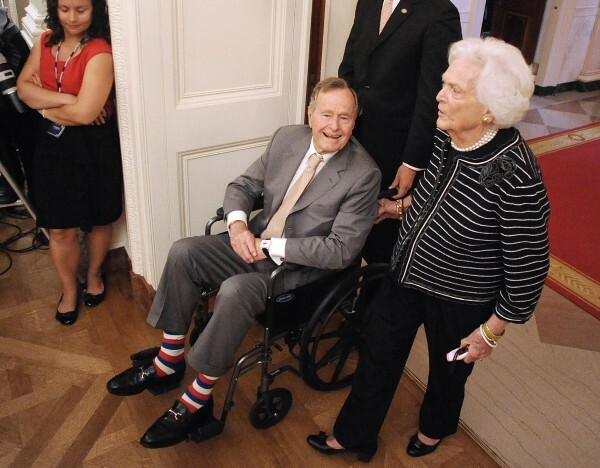 Bush, and his wife, Barbara Bush, endorsed incumbent GOP Gov. Paul LePage for re-election. Bush retired to Texas after leaving the White House, but his family has long maintained a mansion — dubbed “The Bush Compound” — in Kennebunkport, where the former president is known to spend much of his summers. He and the former first lady mentioned their affinity for Maine in their statement. The Bushes cited LePage’s “tenacity” in implementing a plan to pay off hundreds of millions of dollars of debt owed to its hospitals, including the Dorothy Walker Pavilion at Southern Maine Medical Center and the Barbara Bush Children’s Hospital at Maine Medical Center. Bush becomes the highest elected official to have endorsed LePage this cycle. LePage has also benefited from the support of Gov. Chris Christie, R-New Jersey, who heads the Republican Governors Association. His Democratic opponent, U.S. Rep. Mike Michaud, also has been endorsed by a former president — Bush’s successor, Democrat Bill Clinton — who stumped for Michaud in Portland last month. Former Secretary of State Hillary Clinton will join Michaud on Oct. 24 in Scarborough. On Oct. 30 — five days before the election — President Barack Obama also will appear in Portland in an attempt to give Michaud a final bump as Mainers prepare to head for the polls. First lady Michelle Obama held a rally with Michaud in Orono earlier this month. The independent gubernatorial candidate, Eliot Cutler, has been endorsed by Maine’s junior U.S. senator, Angus King, a fellow independent.